We members of the indigenous people of Biafra (IPOB) and its leadership worldwide under the command and leadership of Mazi Nnamdi Kanu the prophet of our time wish to congratulate the honourable members of the Nigerian Senators for summoning the courage to vindicate our leader Mazi Nnamdi Kanu and IPOB on the floor of Senate chamber through their rejection of restructuring saga in Nigeria. We are equally thanking them for voting down the controversial call for restructuring that cannot benefit anyone in Nigeria. We Biafrans and other sensible Nigerians can now believe that Northern Senators have demonstrated, through their rejection of restructuring, that IPOB remains the only legitimate voice that understands the plight of the masses and prepared to do something about it. 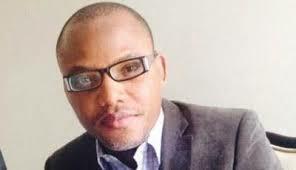 Only a referendum can resolve the issue of Biafra not restructure. It remains the only way the masses can decide their future in Nigeria. As a result of the rejection of this restructuring issue on the floor of the Senate chamber, we IPOB now hope that all socio-cultural groups like PANDEF and Ohaneze Ndigbo to come to the inescapable recognition that only a referendum can determine our fate once and for all time and resolve the perennial issue of resource control. Nigeria is politically, socially and economically structured by Hausa Fulani oligarchs and cabals in the corridors of power supported by their collaborators British Government to cater for the interest of the very few political criminals and poorly educated few at the top who answer to the title of 'elite' with absolutely nothing to offer or show for it. They represent the worst form of mediocrity and arrested development. This total rejection of restructuring in Nigeria by honourable Nigeria Senators is a clear indication to all and sundry, mostly the PANDEF, Ohaneze Ndi-Igbo and so called leaders of thoughts and elders in Biafraland that Nigeria can never be one and cannot recognize them as part of Nigeria because most of our people called for Nigeria restructuring before now but Hausa Fulani and their collaborators rejected it. It is on record that our leaders, heroes, and elders have been calling for this particular restructuring before and after Nigeria independence of which Mrs. Margaret Ekpo was the first person who called for it, Dr. Nnamdi Azikiwe in 1945, Isaac Adaka Boro in 1963, Chukwemeka Odumegwu Ojukwu in 1967 that is known today as (Aburi accord) which later led to the massacre and starvation of Biafran children, women in churches, hospitals, schools and market places in cold blood between 1966 and 1970 and lastly Ken Saro Wiwa in 1993 who campaigned vigorously, without a single gun shot, for the survival of his people. All these people are Biafrans or better put Eastern Nigerians who saw the decay in the Nigeria system and called for a peaceful settlement that will benefit everybody. But the born to rule mentality of the core North rejected it with impunity. Today they demonstrated it again on the floor of the Senate.